After a year of a tumultuous U.S. administration and erratic policies, the exhibitions industry continues to grow and prove that face-to-face interactions are important in the business model. The Center for Exhibition Industry Research (CEIR) provides countless insights for the exhibitions industry on attendee engagement, show strategy and much more. Note: International Association of Exhibitions and Events (IAEE) and CEIR subscribers can download most of these reports for free! 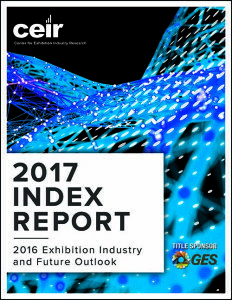 The CEIR Index Report was developed to provide an objective measure of the annual performance of the exhibition industry. It is the leading industry resource tracking overall market performance of business-to-business exhibitions in the United States. It offers a valuable tool for strategic planning, benchmarking and evaluating business development opportunities. Exhibition Forecast: Growth will pick up the pace to around 2.5% in 2017 before accelerating to 2.8% expansion in both 2018 and 2019.